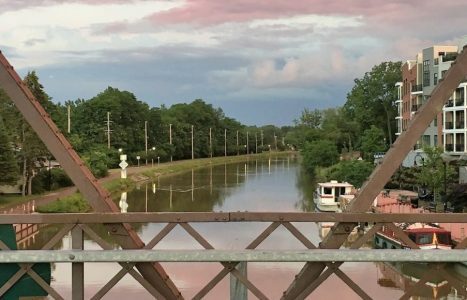 Home Ramblings Catching Up – Fast Forward Through The Erie Canal! 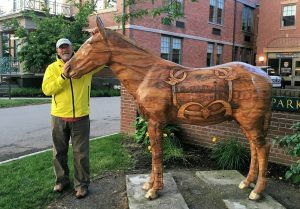 Catching Up – Fast Forward Through The Erie Canal! Where to start? 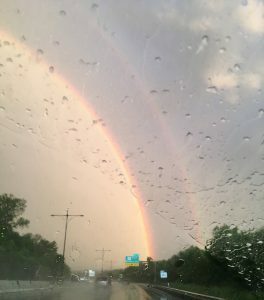 A month ago, I was marveling that we traveled from Rhode Island to Pittsford NY in 6.5 hours retrieving our vehicle – a distance that took us 29 days to achieve via the water. How’s that for perspective? 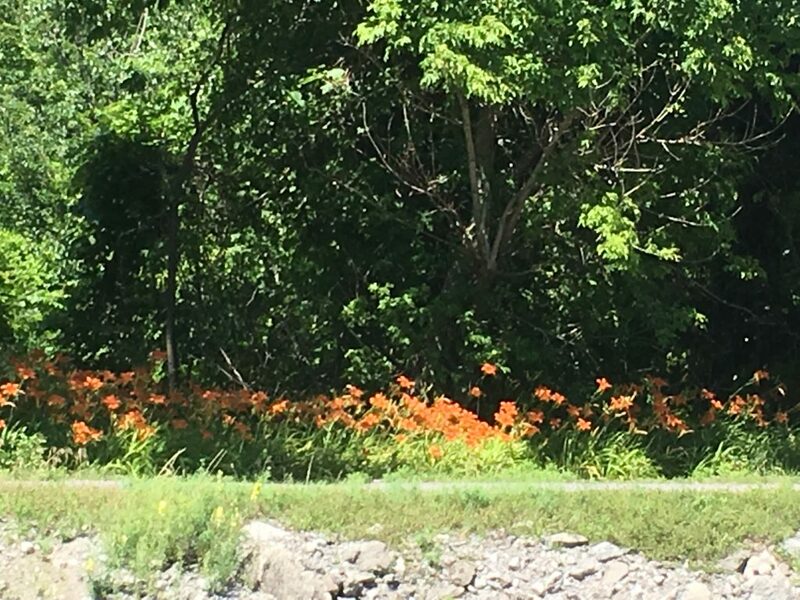 And with the same speed of our vehicle ignoring the speed limit, I will attempt to do a fast catch up with our blog or at least our trek across the Erie Canal. 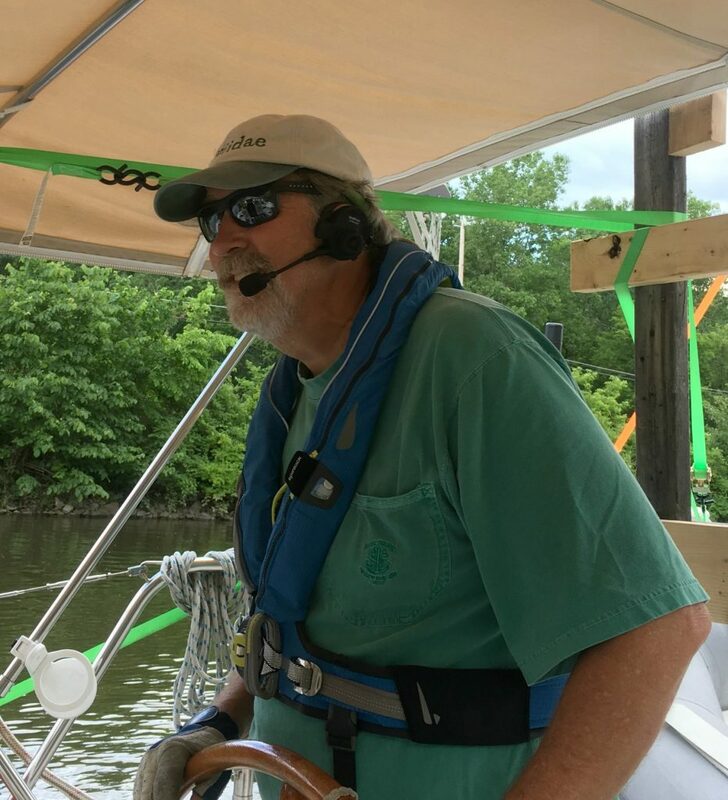 From Dan’s posts, you will read about our various issues related to the “new boat blues.” I’m taking the ostrich approach and putting my head in the sand as it comes to the numerous unexpected costs we’ve incurred. 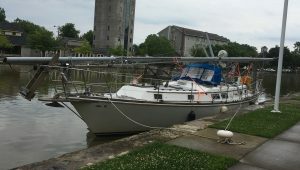 Suffice it to say our plans to attend the Great Lakes Cruising Club Rendezvous went out the window when our charging system went south AND we discovered the awful smell coming from the head (aka toilet) was due to a cracked pump. Sorry to blow your exotic ideal of us in perpetual sailing bliss! 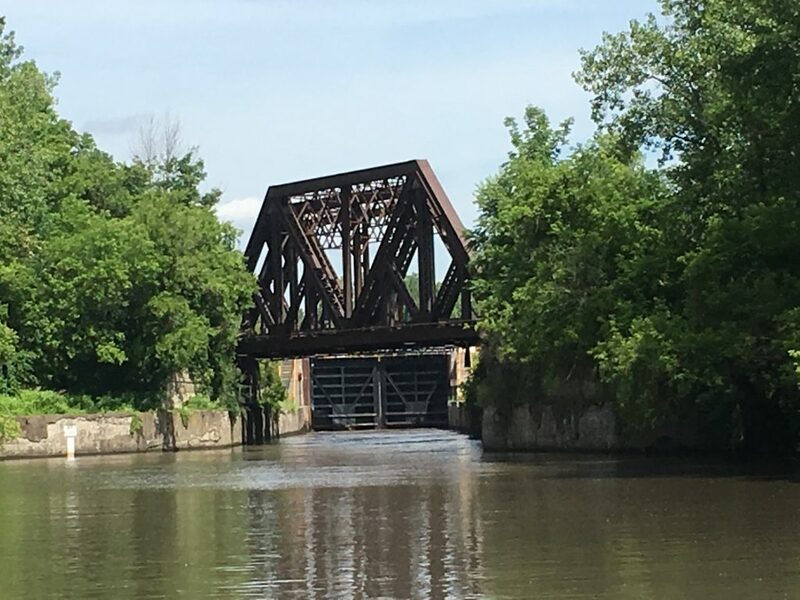 Our trip across the Erie Canal became more of a hurry up and wait game as we timed our forward progression with lock and bridge openings and where we could stop each day and be sure we had shore power (and bathroom facilities!) 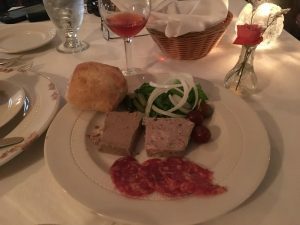 It’s not say that we did not enjoy our time, we did but it was not as relaxing as I expected nor did we have the option to dawdle along and explore the way we like. Among the things we did enjoy were the repeated encounters with boats that we met along the way. 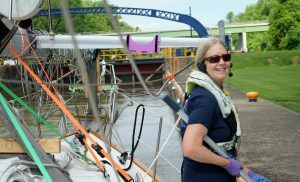 The most extreme example of these serendipitous rendezvous was running into the sailboat across the finger pier we tied to as we prepared to drop Gaviidae’s mast in Catskill, NY. We had left the vessel behind and were halfway across Lake Erie when we saw it again in Geneva OH four weeks later. The result of smacking a lock wall – cradle failure, note the support on the front and the tipped over spreaders. 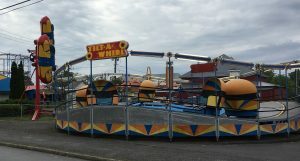 We ran into a cruising couple we knew from Minneapolis, for example, who was among the numerous Loopers who tended to flock together. 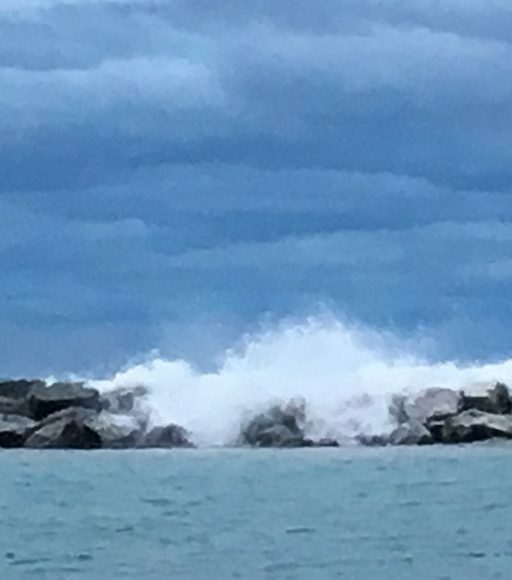 Loopers are people on trawlers, motoryachts, tugboats and, yes, even sailboats who make the loop from Lake Michigan, down the Mississippi River to the Gulf, around the Florida peninsula, up the east coast and then to the Great Lakes. 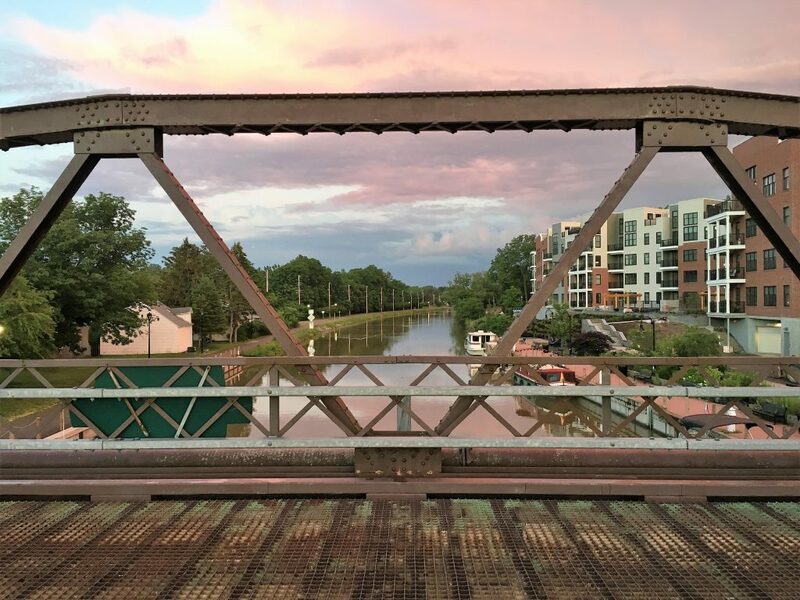 Not all loopers start and end their year-long journey in the Great Lakes, but the Erie Canal is a leg of the loop, whether they start out in Duluth or Fort Meyers. For those who we met once or multiple times along the Canal, there were many conversations comparing notes as to who had the most horrific lock experience for the day. I’ll give the award to one sailboat who hit the wall of a lock hard enough to topple their mast cradle – ouch! 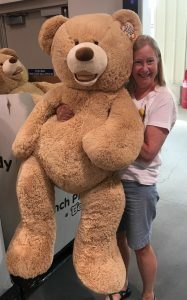 So what did we see and do along the canal? I’ll let the pictures do the fast catch up! 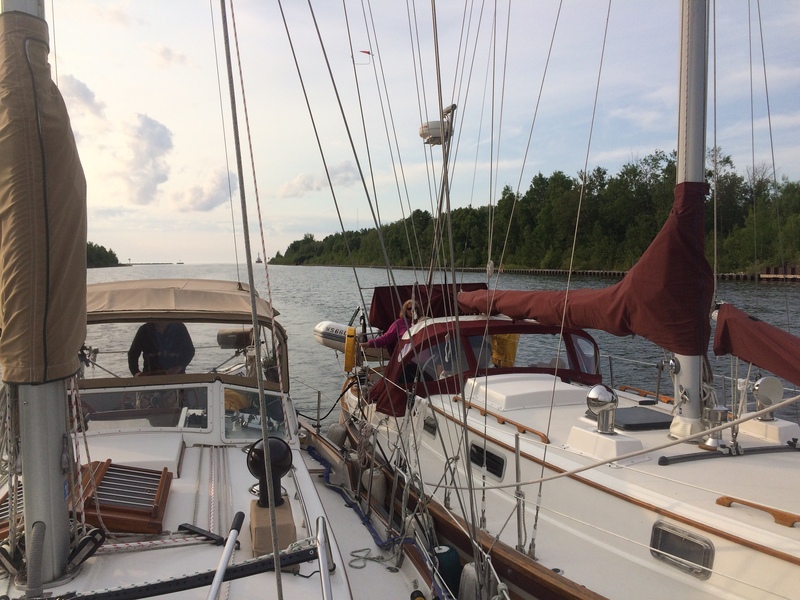 enjoyed a picnic dinner with the crew from S/V Midnight (Jon and Teresa) – a beautiful navy Gozzard 44. We’d been hearing rumors of another Gozzard coming up the canal behind us and they caught up! 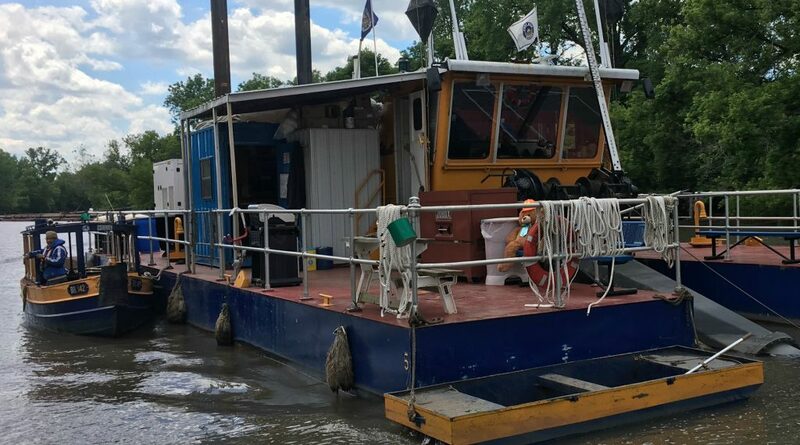 June 22 Dredging Barge complete with a Teddy Bear as crew (look close to see him)! Funny thing (or not) occurred after we left Little Falls. A big cruiser departed just before us and we ended up having to wait for the lock to clear. As we puttered along after them towards Utica NY, this same big cruiser was blocking the channel. At first I thought they had run aground but as we got closer we saw they were pulling up their anchor and to the west side of the canal. As we passed we saw a large number of cars and official vehicles clustered on the low bluff along the shore. Some of those “officials” were toting guns and wearing flak jackets. The cruiser pulled out right in front of us and we could clearly see a body bag on a stretcher not far from the edge of the bluff. Wondering whether there had been some serious altercation on the boat or some other equally heinous occurrence we continued down the waterway. We later shared a dock with this same boat and learned that they had come across a body floating in the canal. Oooeeee-creepy! We were suddenly very grateful that we had not been the first boat through that lock! 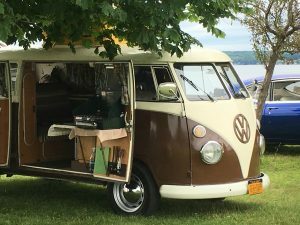 June 22 Sylvan Beach on the shore of Lake Oneida – a tourist town stuck in the 50’s! 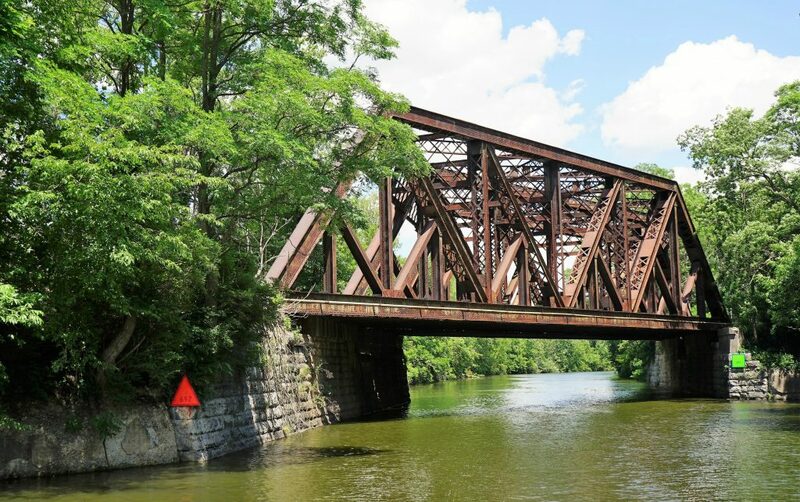 Much of the western section of the Erie Canal is farmland and wildlife preserves – a peaceful float down a picturesque river and my favorite part of the trip. On our trek from Weedsport to Fairport NY we were in an area that was fairly remote and peaceful. 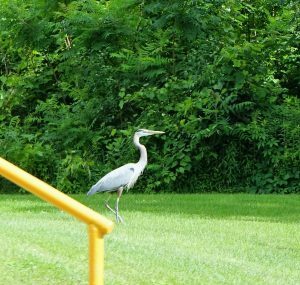 We were escorted by numerous herons along the way, passed several deer that completely ignored our presence and saw a large number of fish jumping. 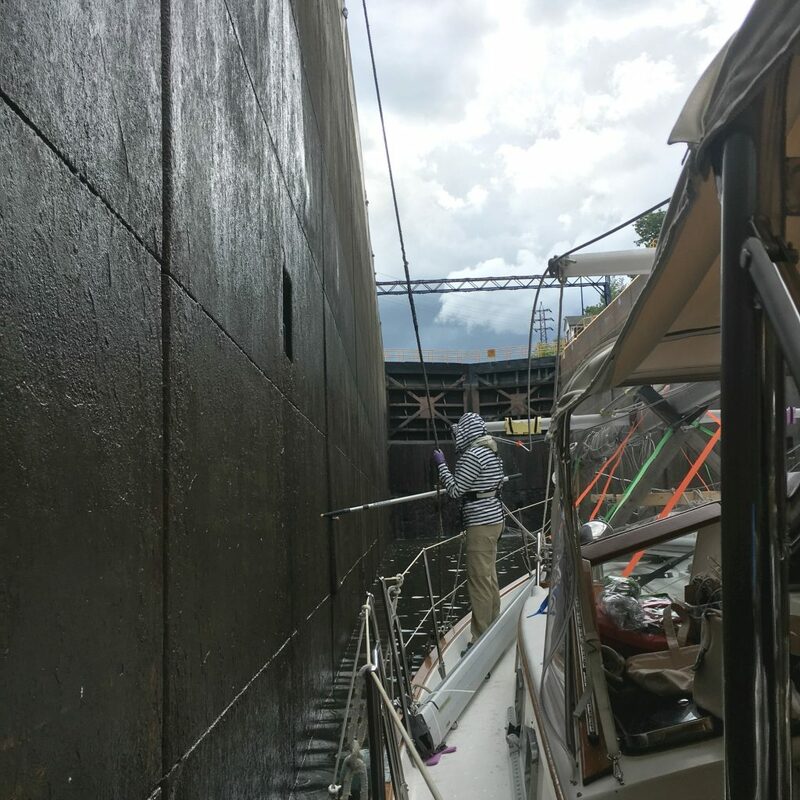 We went through seven locks and got caught in a wild thunderstorm as we were going between Lock 29 and 30. 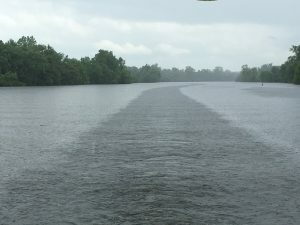 The rain did it’s best to help fill the lock faster on #30. July 1 Gaviidae dressed for the holiday in Pittsford NY near Rochester. We intended to stop in Pittsford just long enough to enjoy breakfast. Breakfast turned into a six day stay as our alternator failed completely. Fortunately Dan found a fabulous repair shop that was able to get us a new alternator and came to the boat to ensure all was running correctly. 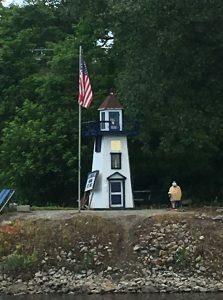 In the interim, we traveled back to Rhode Island and retrieved our vehicle, decorated the boat with flags, made a trip to Costco and had another get-together with fellow Gozzard owners from S/V Midnight. 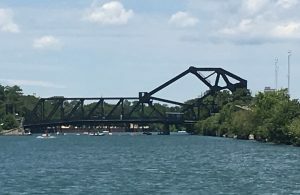 We spent July 4 at Smith Boys Marina in North Tonawanda where we had front-row seating of the fireworks from the deck of our boat. 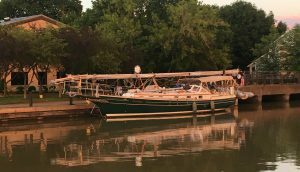 The next day started the scramble to get our sailboat back into sailboat form – mast raised, rigging tuned, boom and sails attached. It was quite the process taking 3-4 people along with a hefty crane. 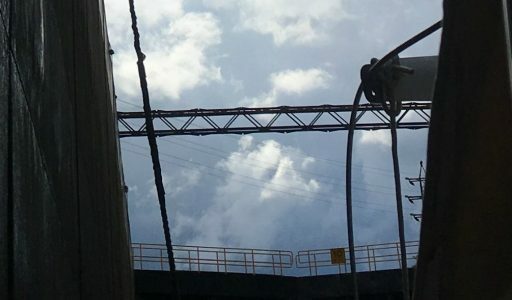 We had taken plenty of pictures before the mast came down but it still took us the better part of a day to get all lines/sheets in their proper place. 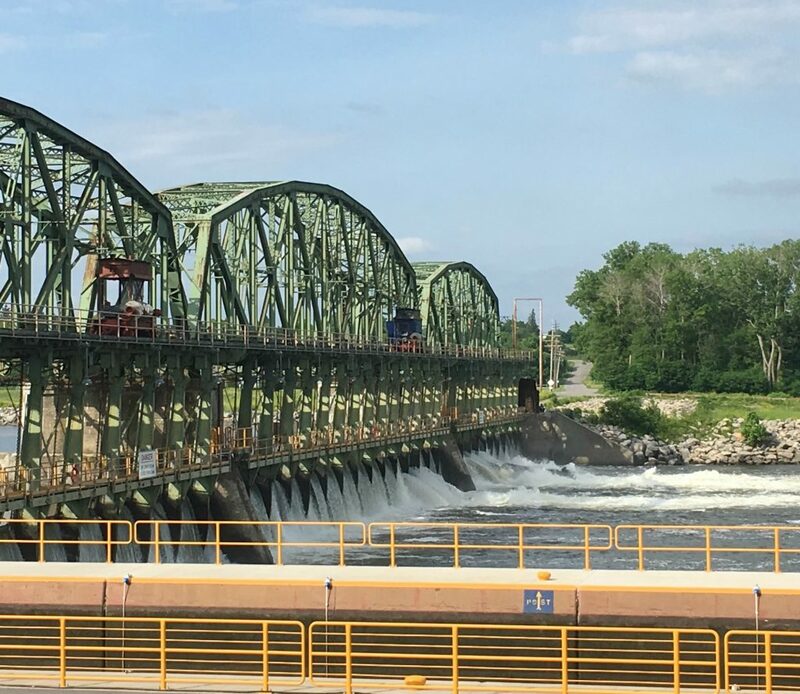 We finally departed the Erie Canal July 9 and made our way up the Buffalo River and through the last lock–a Federal lock, just like the stealth lock back in Troy NY nearly a month earlier. 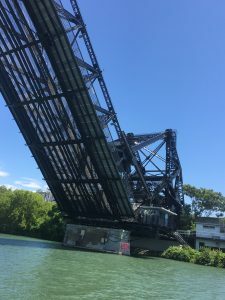 We then passed under an ancient Bascule bridge and waited on a sculling regatta before we finally reached Lake Erie. 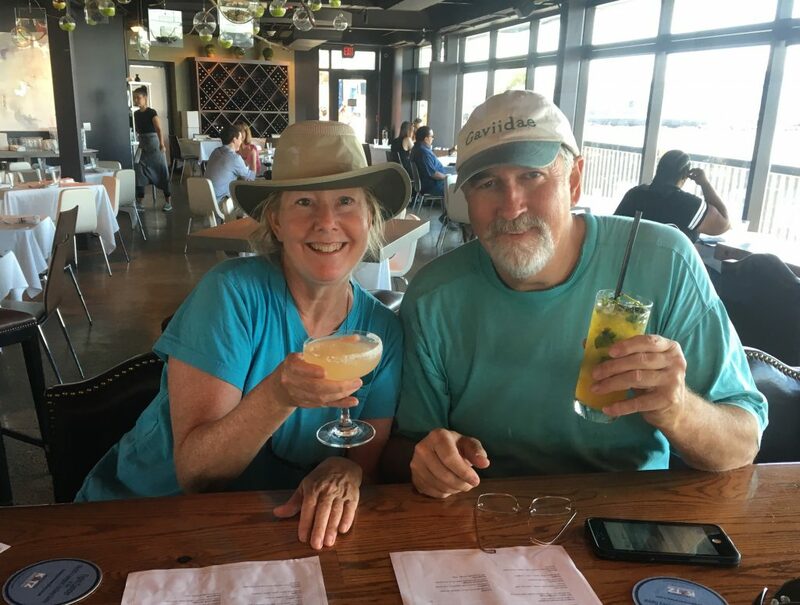 July 9 Officially on Lake Erie – celebrating the journey! Good to hear from you. Hope all is working well now. Sailing Huron for the rest of the summer? Yes – currently heading to Baie Finn in the North Channel. Will bop around this area through mid-September and then head to Goderich.